When shopping for a vehicle, you create some rules for yourself. You want to find something that is safe to drive, something that will help you keep your family safe. 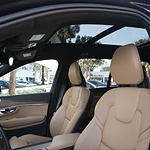 Consider the popular luxury SUV from Volvo that is the XC90. This vehicle is equipped with the safety features that you are seeking. When driving around town, you can discover that the Blind Spot Information System that is part of the Volvo XC90 will assist you so that you stay safe. This will keep you from moving into other traffic and it will help you know when it is safe for you to switch lanes. There is a special program in place in the Volvo XC90 that can help look out for you if you are involved in a crash while driving this vehicle. This special feature can help to protect you from whiplash and help you stay safe.